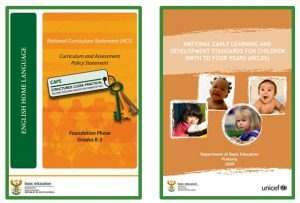 The curriculum that is supplied to the creches we support has been developed by an early childhood development specialist and is in line with the Department of Education’s CAPS Curriculum and Assessment Policy Statement for foundation phase for children 5 to 6 years of age – Grade R & the Department’s NELDS National Early Learning and Development standards for children birth to four years of age. We encourage all principals and teachers to attend monthly workshops at our Training and Resource Centre where we focus on the curriculum and monthly themes. It also provides a platform to discuss challenges, suggestions, as well as motivating teachers and sharing inspiring success stories. Where possible, the Principals and Teachers attend an 18 month NQF level 4 accredited training with Teachers Learning Centre, an Accredited ECD Training Provider that focusses on Early Childhood Development. The curriculum is covered in detail in the course.